THE SUV THAT THINKS IT’S A SPORTS CAR. A PRICE THAT DOESN’T. The E-PACE. A sports car-inspired SUV. A unique balance between agility and ride comfort. Driver-focused cockpit and an elegant, spacious interior. Not all cars follow the same pattern. 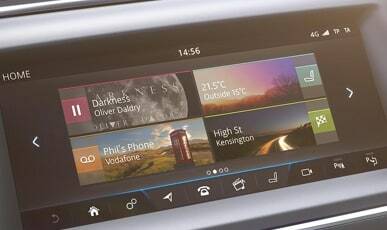 To enrich the in-car experience, Touch Pro offers up to 4 customisable homescreens and fast response times as well as voice control. The interactive side panel lets you select from a choice of panels – so your main screen area can be used for navigation, while the side panel provides phone controls. Simply swipe up and down to switch between multiple panels. 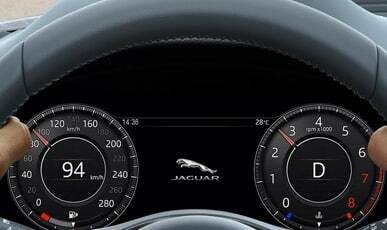 Ensuring you’re always entertained, informed and connected, E-PACE features 12.3" high-definition Interactive Driver Display. The system can receive and project a vast amount of driving information, entertainment and active safety data including navigation, phone and media. This feature is standard on HSE Specification Packs. Bring your music to life with a choice of two sound systems from British audio experts Meridian. Choose the exceptional definition, crystal clear highs and full, deep bass of Meridian Sound. Or, for all the fullness and clarity of a live performance, choose the superb Meridian Surround Sound System with Trifield™ technology. Discover the excitement of driving the E‑PACE. Offering a unique balance between agility and ride comfort, the fully independent suspension system has a sophisticated multi-link rear suspension design. 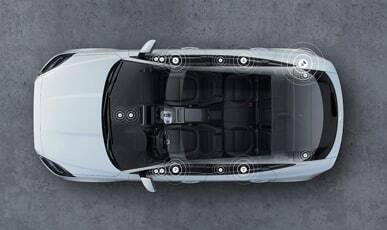 Advanced driving technologies including Active Driveline and Adaptive Dynamics ensure E‑PACE delivers an agile, controlled ride..
48 month term. Model shown (including Exterior Black Pack, 20” ‘Style 6014’ Diamond Turned alloy wheels and LED headlights with signature DRL) from £350 a month, plus initial rental in advance of £3,151. Based on mileage of 8,000 miles per annum. Excess mileage charges apply.